* Delivery and pickup of AM/PM and international packages only. No standard pickups or deliveries. If a rush order has a turnaround of 3 business days, your order will print in (2) two business days after approval and processed payment. The order will ship on the (3rd) third day. IF AN ORDER HAS A RUSH TURNAROUND OF 3 BUSINESS DAYS AND IS PLACED BY 5AM PST / 7AM CT / 8AM ET AND APPROVED AND CHARGED/PAID BY 9AM PST / 11AM CT / 12PM ET, THE ORDER WILL PRINT IN TWO BUSINESS DAYS AND SHIP ON THE THIRD BUSINESS DAY. For instance, if an order is placed by Monday, 5AM PST, we will send you an online proof within three hours. Once you approve the order (by 9AM PST), your order will be sent to print and will ship by Wednesday. Rush Turnaround Example: Please allow one day for receipt of labeling and billing information before counting turnaround time for shipping. For example, if you are quoted a shipping time of 3 business days from February 3rd, please allow the first day for GotPrint to relay your information to the shipping carrier for the arrival scan, and the following 3 business days/non-holidays for your shipment to arrive. Please be advised that during the holiday season, our rush printing turnaround time will be extended by an additional (2) two business days due to an increase in volume. Thank you for your cooperation. *Days are for mailing time and do not include print time. CUSTOM DESIGN: 2-4 business days. 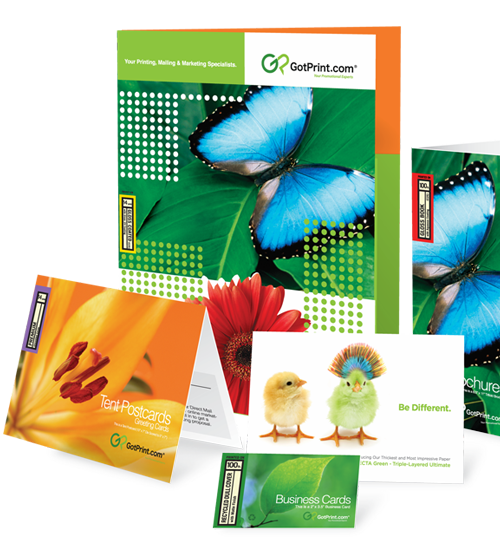 CUSTOM DESIGN: [booklet/catalog]: Varies depending on page count. LOGO DESIGN: 2-4 business days after processed payment. SPECIALTY WORK - [printing, bindery, die cutting etc. ]: 3-10 additional business days. Please be advised that during the holiday season, our regular printing turnaround time will be extended by an additional (2) two business days due to an increase in volume. Thank you for your cooperation. Orders that will be shipped: Please allow one additional business day for receipt of labeling and billing information before counting turnaround time for shipping. For example, if you are quoted a shipping time of 3 business days from February 3rd, please allow the first day for GotPrint to relay your information to the shipping carrier for the arrival scan, and the following 3 business days/non-holidays for your shipment to arrive.